A concentrated look on a brightly lit face catches all the attention. 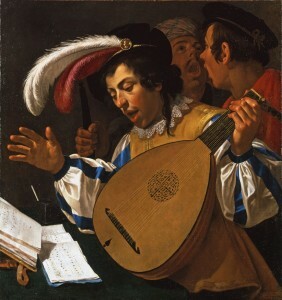 It is the tanned face of the lute player who is the central figure of this scene. Telling from his gestures, he is studying his part of the score and is about to interpret it on his lute. Behind him, two colleagues of his are gearing up to join in. On the table, a pen is dipped in an inkpot. It leaves us with the question, if the lute player is a composer also or if he used the equipment to pen down his own remarks on the music. The present painting was only discovered a few years ago. Van Bijlert rarely dated his pictures, but his Musical Company can be placed quite accurately in the period immediately following his return from Italy in 1624. [i] It is now restored to its rightful place in Van Bijlert’s oeuvre and counts as one of the artist’s most significant productions of his best period. [ii] The broadly painted life-size figures, closely pushed to the picture plane, constitute a very strong example of Van Bijlert’s ability to use the Caravaggesque vocabulary in creating original and spirited compositions. Jan van Bijlert was the son of the Utrecht glass painter Herman Berentz van Bijlert who most probably was his first teacher. According to the German artist Joachim von Sandrart, he was apprenticed to Abraham Bloemaert. Following the completion of his studies, he travelled to France and later to Italy. In 1621 he was recorded in Rome where he may have been one of the founders of the Dutch society of artists, the Bentvueghels (Birds of a Feather). Van Bijlert had returned to Utrecht by 1625, when he married Margrieta Jan Kemincxdr with whom he had at least three children. After his first wife died, he remarried with Cecilia van Velthoven in 1660. Van Bijlert played an active role in the artistic life of Utrecht. He was highly prolific and successful throughout his career. Together with Dirck van Baburen, Hendrick ter Brugghen and Gerard van Honthorst he spread Michelangelo da Caravaggio’s strong realism and chiaroscuro in the 1620s. However, in the course of years he developed a more classicizing manner. [i] In a report from November 2002, Paul Huys Janssen substantiates this date by pointing to Van Bijlert’s painting of Saint Sebastian tended by Irene, dated 1624, which is remarkably close in style to ours, especially in the folding of the draperies and the way the hair of the figures is painted. Austria, Schloss Rohrau, collection Count Harrach. See for this picture: Huys Janssen, op. cit., no. 31, pp. 107,225, ill. Another painting in Brunswick, Herzog-Anton-Ulrich-Museum, The Matchmaker from 1626, is equally close. The rendering of the feathers is similar and the ear ornament on the young woman recurs as a bigger variant in our painting on the protagonist’s beret. See: ib., no. 134, pp. 149,276, ill.
[ii] A few unknown pictures have been rediscovered since the publication of Paul Huys Janssen’s book on the artist: Jan van Bijlert 1597/98 – 1671: Catalogue Raisonné, Amsterdam & Philadelphia 1998. However, these rediscoveries are late works and considered less interesting.